Bach to Baby have two opportunities for nurseries and schools. We welcome group visits to our concerts and also have a Bach to School program which enables our musicians to come to you! 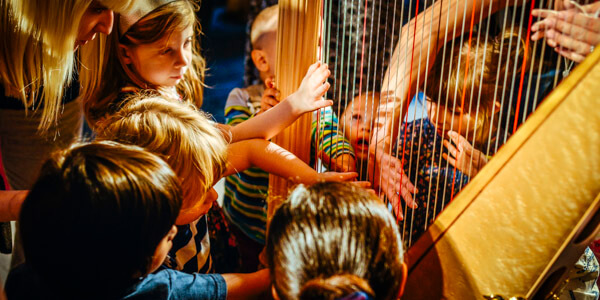 Our musicians come to you, removing the need for travel to London venues and leaving a memory of musical excellence within your school or nursery. In addition to performing regularly on the international stage, our musicians are experienced in presenting to children and in a format that makes the finest classical music accessible. We have just launched our Bach to School programme, offering interactive concerts performed by top-flight professional concert artists, which will take your pupils deep inside the world of classical music. We are presenting a special series of concerts in London, Surrey and Birmingham towards the end of the academic year. We can also arrange to come to your school with a programme tailored specifically for you. Find out about both options on our dedicated website. Bach to Baby is a popular outing for nurseries. We offer reserved seating so that things work as smoothly as possible and you can enjoy the music to the full. If your group would like to attend a concert, please book tickets at least one week in advance so that we can make the necessary arrangements. Group Tickets are £5/child and £3/staff and accompanying family members. We can accommodate groups of up to 20 children. Ready to book, or have more questions? Fill in the form below, and we'll get back to you with more information. Please give us information about the age group of children, how many children and adults are intending to come, and any queries you may have.